I wouldn’t exactly say this is a seasonal dessert…rest assured I will be making it in May for my brother at some point. It is peanut buttery rich & delicious. I made it this past weekend (with my husband in mind) for a family Christmas…just a little something different. *Please note the photo may not be the most wonderful thing you have seen on this Monday morning (I guess unless you love peanut butter and chocolate that much then who cares right? )…there was about a 45 second window where I was able to take the picture. In the bowl of an electric mixer (or using a hand mixer), beat heavy cream and sugar on medium-high speed until stiff peaks form. Transfer the whipped cream to an separate bowl and stick in the fridge until ready to use. 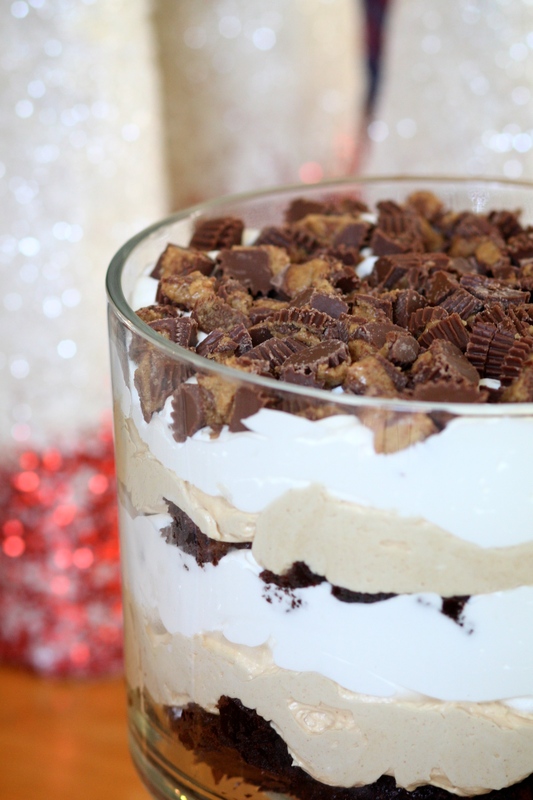 Layer brownies in bottom of trifle bowl then top with layers of peanut butter mixture, whipped cream and chopped peanut butter cups. Repeat and enjoy. Recipe adapted slightly from How Sweet Treats. This entry was posted in Trifle. Bookmark the permalink.